Then again, it is Jack Nicklaus. Pressure? Nah. The Golden Bear will headline a who’s who of golf legends and greats assembled Saturday in Blaine, Minn., just outside Minneapolis, when the Greats of Golf Challenge is played at TPC Twin Cities as part of the 3M Championship on the PGA TOUR Champions. Jack Nicklaus will partner with Lee Trevino, David Graham and team Captain Jerry Pate to take on a field of greats who are either World Golf Hall of Fame members, have 20 or more career victories on the PGA TOUR and PGA TOUR Champions, or are former major championship winners. The Greats of Golf Challenge will be woven into Golf Channel’s coverage of the 3M Championship from 3:00 to 6:00 p.m. ET. “Team Ryder Cup” will be made up of Andy North, Dave Stockton and Tom Weiskopf, with Tony Jacklin serving as captain. “Team Major Fun” will feature Fuzzy Zoeller, Hale Irwin and Ben Crenshaw, with Bill Rogers as captain. “Team LPGA” is highlighted by Annika Sorenstam, Nancy Lopez and Pat Bradley, with Captain Al Geiberger in support. Greats Charles Coody and Jim Colbert will also be on hand to participate in some of the fan-focused activities. Team Greatest Ever has arguably golf history’s greatest ever in Nicklaus. Retired from championship golf since 2005, the Golden Bear leads the pack of legends with 73 victories on the PGA TOUR, including 10 victories on the PGA TOUR Champions (formerly the Senior Tour, Champions Tour). As part of his 120 professional wins worldwide, the Golden Bear owns a record 18 professional major championship victories, and a record eight senior majors. He is one of only five golfers who have won all four of golf’s modern majors (a.k.a. the “Grand Slam”). Nicklaus remains the only player in history to have completed the career Grand Slam on both the regular and senior tours. Together with playing partners Trevino and Graham, the team has accumulated 110 PGA TOUR wins, 44 PGA TOUR Champions victories, and a combined 26 professional major championships. They also combine to form the oldest group on Saturday at a collective 222 years. Last year in the Greats of Golf Challenge, batting cleanup for teammates Trevino and Gary Player, Nicklaus made no fewer than five team-saving birdie putts to help spark the trio to a thrilling 17-under-par performance in the competition. 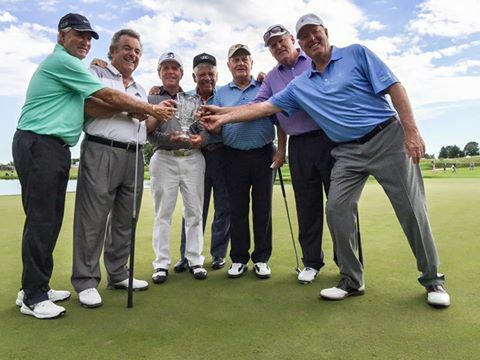 The group tied the foursome of Captain Tony Jacklin, Johnny Miller, Dave Stockton and Tom Weiskopf. Although tournament officials wanted to award the trophy to Team Greatest Ever’s undermanned trio, the Golden Bear insisted on a tie. Admission to the 3M Championship is free all week. For more information, visit 3mchampionship.com.